High blood pressure is a chronic health condition that has a few signs and symptoms. However, it can greatly increase your risk of stroke and heart disease. Researchers have found that several methods can help lower blood pressure. These methods could include medication or not. Calcium Channel Blockers: The drug keeps calcium from entering the muscle cells of your heart and blood vessels. This allows blood vessels to relax, which can lower your blood pressure. Diuretics (Water or Fluid Pills): this drug can flush excess sodium from your body and reduce the amount of fluid in your blood and helps to lower your blood pressure. Vasodilators: the drug relaxes the muscles in blood vessel walls, which can lower blood pressure. Beta Blockers: the drug helps your heart beat slower and with less force. As a result, your heart pumps less blood through your blood vessels, which can help to lower your blood pressure. Alpha-Beta Blockers: the drug reduces nerve impulses the same way alpha blockers do. However, like beta blockers, they also slow the heartbeat. As a result, blood pressure goes down. Central Acting Agents: the drug acts in the brain to decrease nerve signals that narrow blood vessels, which can lower blood pressure. Angiotensin-Converting Enzyme (ACE) Inhibitors: Angiotensin-II is a hormone that narrows blood vessels and increases blood pressure. 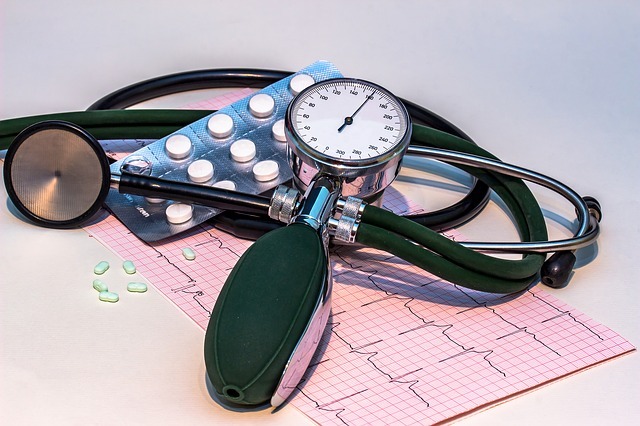 ACE inhibitors could stop the production of Angiotensin II, and this can lower blood pressure. Angiotensin II Receptor Blockers (ARBs): This type of drugs block angiotensin II hormone from binding with receptors in the blood vessels. When angiotensin II is blocked, the blood vessels do not constrict or narrow, which can lower your blood pressure. Alpha Blockers: the drug reduces nerve impulses that tighten blood vessels. This allows blood to flow more freely, causing blood pressure to go down. Eat a healthy diet. You need to choose an eating plan rich in vegetables, fruits, whole grains, and low-fat dairy and low in saturated fat and added sugars. Cut down on sodium. Many people eat more sodium (found in salt) than recommended. Cut down your sodium intake is very important. Remember that most of the salt comes from processed food (such as soup and baked goods). Be physically active. You should try to get physical activity for at least 30 minutes on most days of the week. Have a good night’s sleep. Body clock is very important for regulating blood pressure. If you experience sleep apnea, tell your doctor and get treatment. Getting a good night’s sleep may help reduce blood pressure. Keep a healthy weight. Overweight and obesity can increase your risk of high blood pressure and many other health conditions. If you need to lose weight, try to keep it steady. Quit smoking. Smoking raises your risk for heart disease, stroke, and many cancers. Try to stop smoking so you can avoid these health problems. Drink less alcohol. If you can, stop drinking alcohol. But if you have to drink, you should have no more than 2 drinks a day (men) or no more than 1 drink a day (women).